†† Get UP TO $1,200 REBATE ON SELECT 2018 OUTLANDER MODELS : Eligible units are select new and unused 2018 Can-Am Outlander models. The buyer of an eligible 2018 model will receive up to $1,200 rebate. Rebate amount depends on the model purchased. While quantities last. †† 2018 Can-Am Outlander 450 at: As Low As $99 per month. Example: Tier A and B Customers: On a purchase where the Amount Financed is $5,009, your Down Payment is $290 with 60 monthly payments of $98.95 each. Interest Rate is 6.9% [ANNUAL PERCENTAGE RATE 6.9% (E)]. 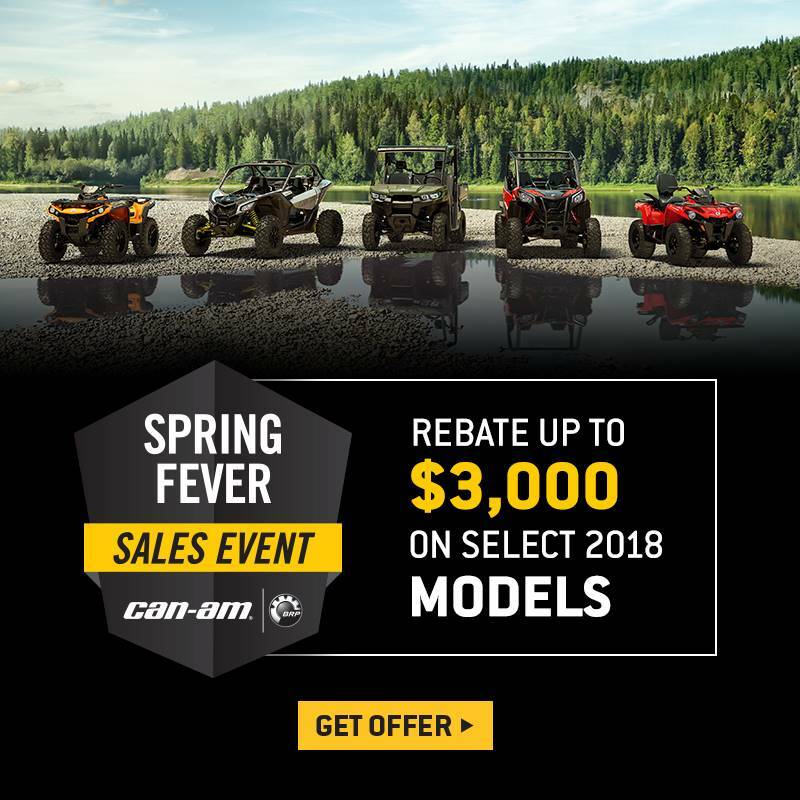 †† Get $800 REBATE ON SELECT 2018 MAVERICK TRAIL MODELS : Eligible units are select new and unused 2018 Can-Am Maverick Trail models. The buyer of an eligible 2018 model will receive $800 rebate. While quantities last. Eligible units are select new and unused 2018 Can-Am Commander models. The buyer of an eligible 2018 model will receive up to $1,500 rebate. While quantities last.